For other uses, see Book of Abraham (disambiguation). The first page of the Book of Abraham. A portion of the papyri used by Joseph Smith as the source of the Book of Abraham. The difference between Egyptologists' translation and Joseph Smith's interpretations has caused considerable controversy. The Book of Abraham is a work produced in 1835 by Joseph Smith based, he said, on Egyptian papyri purchased from a traveling mummy exhibition. According to Smith, the book was "a translation of some ancient records [...] purporting to be the writings of Abraham, while he was in Egypt, called the Book of Abraham, written by his own hand, upon papyrus". Smith said the papyri describe Abraham's early life, his travels to Canaan and Egypt, and his vision of the cosmos and its creation. The work was canonized in 1880 by The Church of Jesus Christ of Latter-day Saints (LDS Church) as part of its Pearl of Great Price. It thus forms a doctrinal foundation for the LDS Church and Mormon fundamentalist denominations of the Latter Day Saint movement though is not considered a religious text by the Community of Christ. Other groups in the Latter Day Saint movement have differing opinions regarding the Book of Abraham, some rejecting and some accepting the text as inspired scripture. The book contains several doctrines that are unique to Mormonism such as the idea that God organized eternal elements to create the universe (instead of creating it ex nihilo), the exaltation of humanity, a pre-mortal existence, the first and second estates, and the plurality of gods. The Book of Abraham papyri were thought to have been lost in the 1871 Great Chicago Fire. However, in 1966 several fragments of the papyri were found in the archives of the Metropolitan Museum of Art in New York and in the LDS Church archives. They are now referred to as the Joseph Smith Papyri. Upon examination by professional Mormon and non-Mormon Egyptologists, these fragments were identified as Egyptian funerary texts, including the "Breathing Permit of Hôr"[nb 1] and the "Book of the Dead", among others. As a result, the Book of Abraham has been the source of significant controversy. Critics say it is a work of fiction created by Smith, while some Mormon apologists defend its authenticity. The Book of Abraham was purportedly translated by Joseph Smith from Egyptian papyri. Eleven mummies and several papyri were discovered near the ancient Egyptian city of Thebes by Antonio Lebolo between 1818 and 1822. Following Lebolo's death in 1830, the mummies and assorted objects were sent to New York with instructions that they should be sold in order to benefit the bereft heirs of Lebolo. Michael H. Chandler eventually purchased the mummies and artifacts and began displaying them, starting in Philadelphia. Over the next two years Chandler toured the eastern United States, displaying and selling some of the mummies as he traveled. [W]ith W. W. Phelps and Oliver Cowdery as scribes, I commenced the translation of some of the characters or hieroglyphics, and much to our joy found that one of the [scrolls] contained the writings of Abraham, another the writings of Joseph of Egypt, etc. – a more full account of which will appear in its place, as I proceed to examine or unfold them. Smith, Joseph Coe, and Simeon Andrews soon purchased the four mummies and at least five papyrus documents for $2,400 (equivalent to $58,000 in 2018). In October 1835 he began "translating an alphabet to the Book of Abraham, and arranging a grammar of the Egyptian language as practiced by the ancients." In so doing, Smith worked closely with Cowdery and Phelps. The result of this attempted deciphering was a collection of documents and manuscripts now known as the Kirtland Egyptian papers. One of these manuscripts was a bound book titled simply "Grammar & A[l]phabet of the Egyptian Language", which contained Smith's interpretations of the Egyptian glyphs. The first part of the book focuses almost entirely on deciphering Egyptian characters, and the second part deals with a form of astronomy that was supposedly practiced by the ancient Egyptians. The majority of the pages in this tome were penned in July 1835. Most of the writing in the book was written not by Smith but rather by a scribe taking down what Smith said. The "Egyptian Alphabet" manuscript is particularly important because it illustrates how Smith attempted to translate the papyri. First, the characters on the papyri were transcribed onto the left-hand side of the book. Next, a postulation as to what the symbols sounded like was devised. Finally, an English interpretation of the symbol was provided. Smith's subsequent translation of the papyri takes on the form of five "degrees" of interpretation, each degree representing a deeper and more complex level of interpretation. Following the supposed deciphering of the Egyptian alphabet in July and October of 1835, Smith ostensibly translated the majority of the Book of Abraham in November 1835, followed by some minor revisions in March 1842. In translating the book, Smith dictated, and Phelps, Warren Parrish, and Frederick G. Williams acted as scribes. The complete work was first published serially in the Latter Day Saint movement newspaper Times and Seasons in 1842,[nb 2] and was later canonized in 1880 by the LDS Church as part of its Pearl of Great Price. Part of the text describes Abraham's journey from Ur to Canaan and Egypt. The Book of Abraham tells a story of Abraham's life, travels to Canaan and Egypt, and a vision he received concerning the universe, a pre-mortal existence, and the creation of the world. The book has five chapters. 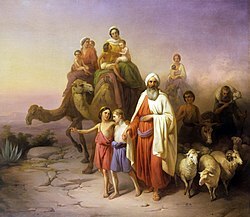 Chapter 1 recounts how Abraham's father Terah and his forefathers had turned to "the god of Elkenah, and the god of Libnah, and the god of Mahmackrah, and the god of Korash, and the god of Pharaoh, king of Egypt". Chaldean priests then sacrifice three virgins to pagan gods of stone and wood, and one priest attempts to sacrifice Abraham himself before an angel comes to his rescue. The text then examines the origins of Egypt and its government. Chapter 2 includes information about God's covenant with Abraham and how it would be fulfilled; in this chapter, Abraham travels from Ur to Canaan, and then to Egypt. In Chapter 3, Abraham learns about an Egyptian understanding of celestial objects via the Urim and Thummim. It is in this chapter that Abraham also learns about the eternal nature of spirits [...] pre-earth life, foreordination, the Creation, the choosing of a Redeemer, and the second estate of man." Chapters 4 and 5 contain expansions and modifications of the creation narrative in Genesis. In Chapter 4, the gods (there are over 48 references to the plurality of the gods in Chapters 4 and 5) plan the creation of the earth and life on the earth. In Chapter 5, the gods complete creation, and Adam names all living creatures. Nearly half of the Book of Abraham shows a dependence on the King James Version of the Book of Genesis. According to H. Michael Marquardt, "It seems clear that Smith had the Bible open to Genesis as he dictated this section [i.e., Chapter 2] of the 'Book of Abraham.'" Smith explained the similarities by reasoning that when Moses penned Genesis, he used the Book of Abraham as a guide, abridging and condensing where he saw fit. As such, since Moses was recalling Abraham's lifetime, his version was in the third person, whereas the Book of Abraham, being written by its titular author, was composed in the first person. The Book of Abraham text is a source of some distinct Latter Day Saint doctrines, which Mormon author Randal S. Chase calls "truths of the gospel of Jesus Christ that were previously unknown to Church members of Joseph Smith's day." Examples include the nature of the priesthood, an understanding of the cosmos, the exaltation of humanity, a pre-mortal existence, the first and second estates, and the plurality of gods. The Book of Abraham expands upon the nature of the priesthood in the Latter Day Saint movement, and it is suggested in the work that those who are foreordained to the priesthood earned this right by valor or nobility in the pre-mortal life. In a similar vein, the Book explicitly denotes that Pharaoh was a descendant of Ham and thus "of that lineage by which he could not have the right of Priesthood". This passage is the only one found in any Mormon scripture that bars a particular lineage of people from holding the priesthood. Even though nothing in the Book of Abraham explicitly connects the line of Pharaoh and Ham to black Africans, this passage was used as a scriptural basis for withholding the priesthood from black individuals. 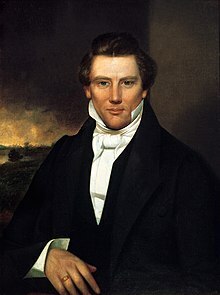 Neither Joseph Smith nor Brigham Young used the Book of Abraham to justify the banning blacks from the priesthood. It wasn't until 1900 that George Q. Cannon, a member of the First Presidency, began using the story of Pharaoh as a scriptural basis for the ban. :205 In 1912, the First Presidency responded to an inquiry about the priesthood ban by using the story of Pharaoh. By the early 1900s, it became the foundation of church policy in regards to the priesthood ban. :205 The 2002 Doctrine and Covenants Student Manual points to Abraham 1:21–27 as the reasoning behind the not giving black people the priesthood until 1978. [Abraham] saw the stars, that they were very great, and that one of them was nearest unto the throne of God; ... and the name of the great one is Kolob, because it is near unto me, for I am the Lord thy God: I have set this one to govern all those which belong to the same order as that upon which thou standest. Based on this verse, the LDS Church claims that "Kolob is the star nearest to the presence of God [and] the governing star in all the universe." Time moves slowly on the celestial body; one Kolob-day corresponds to 1,000 earth-years. The Church also notes: "Kolob is also symbolic of Jesus Christ, the central figure in God's plan of salvation." The Book of Abraham also explores pre-mortal existence. The LDS Church website explains: "Life did not begin at birth, as is commonly believed. Prior to coming to earth, individuals existed as spirits." These spirits are eternal and of different intelligences. Prior to mortal existence, spirits exist in the "first estate". Once certain spirits (i.e., those who choose to follow the plan of salvation offered by God the Father of their own accord) take on a mortal form, they enter into what is called the "second estate". The doctrine of the second estate is explicitly named only in this book. The purpose of earthly life, therefore, is for humans to prepare for a meeting with God; the Church, citing Abraham 3:26 notes: "All who accept and obey the saving principles and ordinances of the gospel of Jesus Christ will receive eternal life, the greatest gift of God, and will have 'glory added upon their heads for ever and ever'." Also notable is the Book of Abraham's insistence that there are many gods, and that "the gods"[nb 3] created the Earth, not ex nihilo, but rather from pre-existing, eternal matter. This shift away from monotheism and towards henotheism occurred c. 1838–39, when Smith was imprisoned in the Liberty Jail in Clay County, Missouri (this was after the majority of the Book of Abraham had been supposedly translated, but prior to its publication). Smith noted that there would be "a time come in the [sic] which nothing shall be with held [sic] whither [sic] there be one god or many gods they [sic] shall be manifest all thrones and dominions, principalities and powers shall be revealed and set forth upon all who have indured [sic] valiently [sic] for the gospel of Jesus Christ" and that all will be revealed "according to that which was ordained in the midst of the councyl [sic] of the eternal God of all other Gods before this world was." Three images (facsimiles of vignettes on the papyri) and Joseph Smith's explanations of them were printed in the 1842 issues of the Times and Seasons. These three illustrations were prepared by Smith and an engraver named Reuben Hedlock. The facsimiles and their respective explanations were later included with the text of the Pearl of Great Price in a re-engraved format. According to Smith's explanations, Facsimile No. 1 portrays Abraham fastened to an altar, with the idolatrous priest of Elkenah attempting to sacrifice him. Facsimile No. 2 contains representations of celestial objects, including the heavens and earth, fifteen other planets or stars, the sun and moon, the number 1,000 and God revealing the grand key-words of the holy priesthood. Facsimile No. 3 portrays Abraham in the court of Pharaoh "reasoning upon the principles of Astronomy". The Book of Abraham was canonized in 1880 by the LDS Church, and it remains a part of the larger scriptural work, The Pearl of Great Price. More recently the LDS Church has softened its position on the Book of Abraham. An essay on the church's website, titled "Translation and Historicity of the Book of Abraham," explains: "None of the characters on the papyrus fragments mentioned Abraham’s name or any of the events recorded in the book of Abraham. Mormon and non-Mormon Egyptologists agree that the characters on the fragments do not match the translation given in the book of Abraham, though there is not unanimity, even among non-Mormon scholars, about the proper interpretation of the vignettes on these fragments." The Strangite branch of the movement does not take an official position on the Book of Abraham. The branch notes, "We know that 'The Book of Abraham' was published in an early periodical as a text 'purporting to be the writings of Abraham' with no indication of its translation process (see Times and Seasons, March 1, 1842), and therefore have no authorized position on it." The Fundamentalist Church of Jesus Christ of Latter-Day Saints holds to the canonicity of the Book of Abraham. For many years, it was believed that all the papyri that served as the basis for the Book of Abraham had been lost during the Great Chicago Fire of 1871. After Joseph Smith's death, the Egyptian artifacts were in the possession of his mother, Lucy Mack Smith, and she and her son William Smith continued to exhibit the four mummies and associated papyri to visitors. Two weeks after Lucy's death in May of 1856, Smith's widow, Emma Hale Smith Bidamon, her second husband Lewis C. Bidamon,[nb 5] and her son Joseph Smith III, sold "four Egyptian mummies with the records with them" to Abel Combs on May 26, 1856. Combs later sold two of the mummies, along with some papyri, to the St. Louis Museum in 1856. Upon the closing of the St. Louis Museum, these artifacts were purchased by Joseph H. Wood and found their way to the Chicago Museum in about 1863, and were promptly put on display. The museum and all its contents were burned in 1871 during the Great Chicago Fire. Today it is presumed that the papyri that formed the basis for Facsimiles 2 and 3 were lost in the conflagration. After the fire, however, it was believed that all the sources for the book had been lost. Despite this belief, Abel Combs still owned several papyri fragments and two mummies. While the fate of the mummies is unknown, the fragments were passed to Combs' nurse Charlotte Benecke Weaver, who gave them to her daughter, Alice Heusser. In 1918 Heusser approached the New York Metropolitan Museum of Art (MMA) about purchasing the items; at the time, the museum curators were not interested, but in 1947 they changed their mind, and the museum bought the papyri from Heusser's widower husband, Edward. In the 1960s the MMA decided to raise money by selling some of its items which were considered "less unique". Among these were the papyri that Heusser had sold to the museum several decades earlier. In May of 1966, Aziz S. Atiya, a coptic scholar from the University of Utah, was looking through the MMA's collection when he came across the Heusser fragments; upon examining them, he recognized one as the vignette known as Facsmile 1 from The Pearl of Great Price. He informed LDS Church leaders, and several months later, on November 27, 1967, the LDS Church was able to procure the fragments, and according to Henry G. Fischer, curator of the Egyptian Collection at the MMA, an anonymous donation to the MMA made it possible for the LDS Church to acquire the papyri. The subsequent transfer included eleven pieces of papyri, including the original of Facsimile 1. Three of these fragments were designated Joseph Smith Papyrus (JSP) I, X, and XI. Other fragments, designated JSP II, IV, V, VI, VII, and VIII, are thought by critics to be the Book of Joseph to which Smith had referred. Egyptologist John A. Wilson stated that the recovered fragments indicated the existence of at least six to eight separate documents. The twelfth fragment was discovered in the LDS Church Historian's office and was dubbed the "Church Historian's Fragment". Disclosed by the church in 1968, the fragment was designated JSP IX. Although there is some debate about how much of the papyrus collection is missing, there is broad agreement that the recovered papyri are portions of Smith's original purchase, partly based on the fact that they were pasted onto paper which had "drawings of a temple and maps of the Kirtland, Ohio area" on the back, as well as the fact that they were accompanied by an affidavit by Emma Smith stating that they had been in the possession of Joseph Smith. In the late 19th century, French Egyptologist Théodule Devéria was one of the first to offer a scholarly critique of Joseph Smith's translation. I return herewith, under separate cover, the 'Pearl of Great Price.' The 'Book of Abraham,' it is hardly necessary to say, is a pure fabrication. Cuts 1 and 3 are inaccurate copies of well known scenes on funeral papyri, and cut 2 is a copy of one of the magical discs which in the late Egyptian period were placed under the heads of mummies. There were about forty of these latter known in museums and they are all very similar in character. Joseph Smith's interpretation of these cuts is a farrago of nonsense from beginning to end. Egyptian characters can now be read almost as easily as Greek, and five minutes' study in an Egyptian gallery of any museum should be enough to convince any educated man of the clumsiness of the imposture. The controversy intensified in the late 1960s when portions of the Joseph Smith Papyri were located. The translation of the papyri by both Mormon and non-Mormon Egyptologists does not match the text of the Book of Abraham as purportedly translated by Joseph Smith. Indeed, the transliterated text from the recovered papyri and facsimiles published in the Book of Abraham contain no direct references, either historical or textual, to Abraham, and Abraham's name does not appear anywhere in the papyri or the facsimiles. Edward Ashment notes, "The sign that Smith identified with Abraham [...] is nothing more than the hieratic version of [...] a 'w' in Egyptian. It has no phonetic or semantic relationship to [Smith's] 'Ah-broam.'" University of Chicago Egyptologist Robert K. Ritner concluded in 2014 that the source of the Book of Abraham "is the 'Breathing Permit of Hôr,' misunderstood and mistranslated by Joseph Smith", and that the other papyri are common Egyptian funerary documents like the Book of the Dead. Original manuscripts of the Book of Abraham, microfilmed in 1966 by Jerald Tanner, show portions of the Joseph Smith Papyri and their purported translations into the Book of Abraham. Ritner concludes, contrary to the LDS position, due to the microfilms being published prior to the rediscovery of the Joseph Smith Papyri, that "it is not true that 'no eyewitness account of the translation survives'", that the Book of Abraham is "confirmed as a perhaps well-meaning, but erroneous invention by Joseph Smith", and "despite its inauthenticity as a genuine historical narrative, the Book of Abraham remains a valuable witness to early American religious history and to the recourse to ancient texts as sources of modern religious faith and speculation". ^ The name of the individual for whom the "Breathing Permit" was intended has variously been rendered as "Hôr" (e.g. Ritner 2013, p. 6), "Hor" (e.g. Rhodes 2005), "Horos" (e.g. Ritner 2013, p. 71), and "Horus" (e.g. Marquardt, H. Michael, Breathing Permit of Horus, retrieved August 9, 2016 ). ^ Facsimile No. 1 and Chapter 1 through chapter 2 verse 18 are to be found in Volume III, No. 9, dated March 1, 1842; Facsimile No. 2 and chapter 2 verses 19 through chapter 5 are to be found in Volume III, No. 10, dated March 15, 1842; Facsimile No. 3 is to be found in Vol. III, No. 14, dated May 16, 1842. ^ The identities of the gods themselves are unspecified in the Book itself, but the LDS Church teaches that God the Father (Elohim), Jesus Christ (Jehovah), Adam (Michael), and "many of the great and noble ones" (Abraham 3:22) participated in the creation. ^ In 1896, two leaders of the church at the time, Joseph Smith III and Heman C. Smith, made the following observation on the Book of Abraham: "The church has never to our knowledge taken any action on this work, either to indorse [sic] or condemn; so it cannot be said to be a church publication; nor can the church be held to answer for the correctness of its teaching. Joseph Smith, as the translator, is committed of course to the correctness of the translation, but not necessarily to the indorsement [sic] of its historical or doctrinal contents. ^ Despite the sale of the mummies and papyri, Bidamon kept in his possession the ten page "'Book of Abraham' Translation Manuscript I", which he later passed onto his son, Charles. The younger Bidamon then sold this item to LDS collector Wilford Wood in 1937, who subsequently donated it to the Church in the same year. ^ Cowdery, in a letter that was published in a Mormon publication, described the papyrus scroll that supposedly contained the Book of Joseph, noting: "The representation of the god-head—three, yet in one, is curiously drawn to give simply, though impressively, the writer's view of that exalted personage. The serpent, represented as walking, or formed in a manner to be able to walk, standing in front of, and near a female figure, is to me, one of the greatest representations I have ever seen upon paper […] Enoch's Pillar, as mentioned by Josephus, is upon the same [scroll]." Larson argues that many of these figures (e.g. the god-head, a snake with legs, and a pillar) can be found on JSP II, IV, V, VI, VII, and VIII. ^ a b Gee 2000a, pp. 4–6. ^ Smith 1842, p. 704. ^ Ritner 2013, p. 11. ^ Ritner 2013, p. 12. ^ Rhodes 2005, pp. 1–2. ^ a b Smith1902, p. 236. ^ Ritner 2013, pp. 14–15. ^ a b Ritner 2013, p. 1. ^ Ritner 2013, p. 2. ^ Gee 2000a, p. 3. ^ Smith et al. 1902, p. 238. ^ Jessee 2002, p. 86. ^ a b c Ritner 2013, p. 18. ^ Ritner 2013, pp. 19–21. ^ a b Ritner 2013, p. 21. ^ Gee 2000a, p. 5. ^ Ritner 2013, pp. 19, 23–24, 31–32. ^ Ritner 2013, p. 27. ^ a b c d e f "The Book of Abraham". LDS.org. Retrieved August 3, 2016. ^ Chase 2014, p. 165. ^ Ritner 2013, pp. 26, 58. ^ Chase 2014, pp. 166–168. ^ Chase 2014, p. 169. ^ Chase 2014, pp. 173–180. ^ a b c Chase 2014, p. 204. ^ Ritner 2013, p. 40. ^ a b Ritner 2013, p. 42. ^ Ritner 2013, p. 52. ^ a b Ritner 2013, p. 36. ^ Larson 1992, pp. 17–18. ^ Chase 2014, p. 160. ^ Bringhurst 254, p. 193. ^ a b Reeve, W. Paul (2015). Religion of a Different Color: Race and the Mormon Struggle for Whiteness. New York City: Oxford University Press. ISBN 978-0-19-975407-6. ^ Dialogue. Dialogue Foundation, 2001. 2001. p. 267. ^ Official Declaration 2, ‘Every Faithful, Worthy Man’. The Church of Jesus Christ of Latter-day Saints. 2002. pp. 634–635. ^ Ritner 2013, p. 59. ^ a b Abraham 3:4. ^ "Kolob". The Church of Jesus Christ of Latter-day Saints. Retrieved August 3, 2016. ^ a b c d Church Educational System 2000, pp. 28–41. ^ a b c "Translation and Historicity of the Book of Abraham". The Church of Jesus Christ of Latter-day Saints. Retrieved August 4, 2016. ^ "Second Estate". Brigham Young University. Archived from the original on 2016-09-23. Retrieved August 5, 2016. ^ "Doctrines of the Gospel Student Manual Chapter 7: The Creation". The Church of Jesus Christ of Latter-day Saints. Retrieved August 4, 2016. ^ Ritner 2013, pp. 31–33, 40. ^ Ritner 2013, pp. 40–41. ^ Ritner 2013, pp. 32–33. ^ Ritner 2013, p. 55. ^ a b c d Ritner 2013, p. 61. ^ Ritner 2013, p. 306. ^ Ritner 2013, p. 326. ^ Ritner 2013, p. 310. ^ "The Book of Abraham". LDS.org. Retrieved August 3, 2016. ^ "Pearl of Great Price". LDS.org. Retrieved August 3, 2016. ^ Smith & Smith 1896, p. 569. ^ "Scriptures". Strangite.org. Archived from the original on October 21, 2013. Retrieved August 4, 2016. ^ "Mediation and Atonement". Fundamentalist Church of Jesus Christ of Latter-Day Saints. Retrieved March 22, 2010. ^ a b c Ritner 2013, p. 62. ^ Peterson 1995, p. 16. ^ a b Todd 1992. ^ a b Ritner 2013, p. 66. ^ a b Reeve & Parshall 2010, p. 269. ^ a b c Ritner 2013, p. 64. ^ a b Wade et al. 1967, p. 64. ^ a b Ritner 2013, p. 65. ^ Wilson et al. 1968, p. 67. ^ Ritner 2013, pp. 65–66. ^ Deseret News, Salt Lake City, November 27, 1967. ^ Larson 1992, p. 61. ^ a b Ashment 2000, p. 126. ^ Larson 1992, pp. 81–87. ^ Larson 1992, p. 82. ^ Larson 1992, pp. 82–84. Ashment, Edward H (December 1979), "The Facsimilies of the Book of Abraham: A Reappraisal", Sunstone, 17.18 . Ashment, Edward H (December 2000), "Joseph Smith's Identification of "Abraham" in Papyrus JS1, the "Breathing Permit of Hor"", Dialogue: A Journal of Mormon Thought, 33 (4): 121–126 . Baer, Klaus (November 1968), "The Breathing Permit of Hor: A Translation of the Apparent Source of the Book of Abraham", Dialogue: A Journal of Mormon Thought, 3 (3): 109–154, retrieved May 30, 2007 . G, D. L (February 1968), New Light on Joseph Smith’s Egyptian Papyri: Additional Fragment Disclosed, 71 (2), Improvement Era, p. 40, retrieved August 9, 2016 . Barney, Kevin (2006), "The Facsimiles and Semitic Adaptation of Existing Sources", in Gee, John; Hauglid, Brian M (eds. ), Astronomy, Papyrus, and Covenant, Brigham Young University, ISBN 9780934893763 [permanent dead link]. Bringhurst, Newell (1981), Saints, Slaves, and Blacks: The Changing Place of Black People Within Mormonism, Greenwood Press, ISBN 9780313227523 . Budge, E. A. Wallis (1899), Egyptian Religion: Egyptian Ideas of the Future Life, Arkana, ISBN 9780806512297 . Chase, Randal S. (2014), Pearl of Great Price Study Guide, Plain & Precious Publishing, ISBN 9781937901134 . Church Education System (2000), The Pearl of Great Price Study Guide (PDF), The Church of Jesus Christ of Latter-day Saints . Cook, Andrew W.; Smith, Christopher C. (2010), "The Original Length of the Scroll of Hôr", Dialogue: A Journal of Mormon Thought, 43 (2) . Crapo, Richley; Tvedtnes, John A (October 1968), A Study of the Hor Sensen Papyrus (109), Newsletter & Proceedings of the Society for Early Historic Archaeology . Crapo, Richley; Tvedtnes, John A (March 1969a), Rediscovery of Smith Papyri Affects Book of Abraham, LDS Student Association Commentary . Crapo, Richley; Tvedtnes, John A (May 1969b), Papyri Give Further Book of Abraham Insight, LDS Student Association Commentary . Crapo, Richley; Tvedtnes, John A (June 1969c), The Hor Sensen Papyrus as a Mnemonic Device: A Further Study (114), Newsletter & Proceedings of the Society for Early Historic Archaeology . Gee, John (1991), Notes on the Sons of Horus, Foundation for Ancient Research and Mormon Studies . Gee, John (1992), "A Tragedy of Errors (Review of By His Own Hand Upon Papyrus: A New Look at the Joseph Smith Papyri by Charles M. Larson)", FARMS Review of Books, Foundation for Ancient Research and Mormon Studies, 4 (1): 93–119, archived from the original on July 4, 2003, retrieved May 30, 2007 . Gee, John (1999), The Ancient Owners of the Joseph Smith Papyri, Foundation for Ancient Research and Mormon Studies . Gee, John (2000a), A Guide to the Joseph Smith Papyri, Foundation for Ancient Research and Mormon Studies, ISBN 9780934893541 . Gee, Jon (2000b), "Eyewitness, Hearsay, and Physical Evidence of the Joseph Smith Papyri", in Ricks, Steven; Parry, Donald; Hedges, Andrew (eds. ), The Disciple as Witness: Essays on Latter-day History and Doctrine, Foundation for Ancient Research and Mormon Studies, ISBN 9780934893459 . Gee, John (2011), "An Egyptian View of Abraham", in Skinner, Andrew C; Davis, Morgan; Griffin, Carl (eds. ), Bountiful Harvest: Essays in Honor of S. Kent Brown, Maxwell Institute, pp. 137–56, ISBN 9780842528047 . Larson, Charles M. (1992), By His Own Hand Upon Papyrus (2 ed. ), Institute of Religious Research, ISBN 9780962096327 . Mauss, Armand (2003), All Abraham's Children: Changing Mormon Conceptions of Race and Lineage, University of Illinois Press, ISBN 9780252028038 . Millet, Robert L. (February 1998), "The Man Adam", Liahona, retrieved August 4, 2016 . Nibley, Hugh (1975), The Message of the Joseph Smith Papyri: An Egyptian Endowment, Deseret Book Co., ISBN 9781590385395 . Peterson, H. Donl (1995), Story of the Book of Abraham: Mummies, Manuscripts, and Mormonism, Salt Lake City, Utah: Deseret Book, ISBN 9780875798462 . Quinn, D. Michael (1998), Early Mormonism and the Magic World View (2nd ed. ), Signature Books, ISBN 9781560850892 . Reeve, W. Paul; Parshall, Ardis, eds. (2010), "Mormon Scripture", Mormonism: A Historical Encyclopedia, ABC-CLIO, ISBN 9781598841084 . Rhodes, Michael D. (Spring 1977), Translation of Fac. #2 (3), BYU Studies Quarterly, retrieved August 4, 2016 . Rhodes, Michael D (1992), "The Book of Abraham: Divinely Inspired Scripture", FARMS Review of Books, Foundation for Ancient Research and Mormon Studies, 4 (1): 120–126, retrieved May 30, 2007 . Rhodes, Michael (2003), Teaching the Book of Abraham Facsimiles, 4 (2), The Religious Educator, pp. 115–23 . Rhodes, Michael D (2005), The Hor Book of Breathings: A Translation and Commentary, Provo, Utah: Brigham Young University, ISBN 9780934893633 . Ritner, Robert K. (December 2000), "The "Breathing Permit of Hor" Thirty Four Years Later", Dialogue: A Journal of Mormon Thought, 33 (4), retrieved May 30, 2007 . Ritner, Robert K. (July 2003), "'The Breathing Permit of Hôr' Among the Joseph Smith Papyri", Journal of Near Eastern Studies . Ritner, Robert K. (2013), The Joseph Smith Egyptian Papyri: A Complete Edition, Signature Books, ISBN 9781560852209 . Smith, Christopher C. (Spring–Summer 2011), ""That Which Is Lost": Assessing the State of Preservation of the Joseph Smith Papyri", John Whitmer Historical Association Journal, 31 (1): 69–83 . Smith, Joseph, III; Smith, Heman C. (1896), The History of the Reorganized Church of Jesus Christ of Latter Day Saints, 2, Herald Publishing House, ISBN 9781601357106 . Smith, Joseph; et al. (1902), History of the Church, 2, retrieved August 9, 2016 . Smith, Milan D. Jr (December 1990), "That is the Handwriting of Abraham", Dialogue: A Journal of Mormon Thought, 23 (4): 167–169 . Spalding, F. S. (1912), Joseph Smith, Jr. As a Translator: An Inquiry, Arrow Press, retrieved October 30, 2016 . Stenhouse, T. B. H. (1873), The Rocky Mountain Saints, D. Appleton and Company . Thompson, Stephen E. (May 1995), "Egyptology and the Book of Abraham", Dialogue: A Journal of Mormon Thought, 28 (1): 143–160, retrieved May 30, 2007 . Todd, Jay M. (1968a), "Egyptian Papyri Rediscovered" (PDF), Improvement Era, 71 (1): 12–16, retrieved June 7, 2011 . Todd, Jay M (1968b), Background of the Church Historian Fragment, 71 (2), Improvement Era, pp. 39–49, retrieved August 9, 2016 . Wade, Glen; Tolk, Norman; Travers, Lynn; Smith, George D; Graves, F. Charles (Winter 1967), "The Facsimile Found", Dialogue: A Journal of Mormon Thought: 51–64, archived from the original on August 19, 2016, retrieved August 7, 2016 . Tvedtnes, John A (April 1970), The Use of Mnemonic Devices in Oral Traditions, as Exemplified by the Book of Abraham & the Sensen Papyrus (120), Newsletter & Proceedings of the Society for Early Historic Archaeology . Tvedtnes, John; Hauglid, Brian M; Gee, John, eds. (2001), Traditions about the Early Life of Abraham, Foundation for Ancient Research and Mormon Studies . Wilson, John A; Parker, Richard A; Howard, Richard A; Hewerd, Grant S; Jerald, Tanner; Hugh, Nibley (August 1968), "The Joseph Smith Egyptian Papyri", Dialogue: A Journal of Mormon Thought, 3 (2): 67–105, retrieved June 2, 2007 . Webb, Robert C. (1915), The Case Against Mormonism, L. L. Walton . Wikimedia Commons has media related to Book of Abraham.